Paper Street Real Estate LLC., a real estate brokerage headquartered in Downtown Manhattan on 85 Broad Street New York, NY 10004, has already marked how quickly they find buyers for their client’s listings. Paper Street Real Estate LLC utilizes niche targeting and analytics to find buyers which greatly speeds up the waiting period of getting into contract. Founded by Kamilla Mishiyeva, a licensed attorney with a strong background in real estate, they cater to the Financial District, Batter Park City, as well as Brooklyn. You can visit them at paperstreetrealestate.com. Kamilla also operates a probate law firm and bankruptcy practice. Sponsored By Two Trees Management Co..
Two Trees has made Dumbo a premier creative and tech hub and one of the most sought-after neighborhoods in NYC. An inspiring company needs an inspiring office. For holistic wellness media company MindBodyGreen, a run-of-the-mill office would not do. The Brooklyn Waterfront Greenway is growing. Supporters and business leaders from Brooklyn’s major economic hubs will raise funds to complete more of the pathway and honor those who have helped at its annual fundraising gala on Wednesday, November 9. Brooklyn Greenway Initiative is working with the NYC Department of Transportation to create a pathway for runners, cyclists and pedestrians stretching from Greenpoint to Bay Ridge that links open spaces and parks together. Thus far, six miles of the Greenway have been completed, leaving eight to go. The nonprofit’s 4th Annual “Greenway + Industry” networking event will bring together businesses and business leaders along the 14-mile stretch of the proposed Brooklyn Greenway to honor NYC Department of Transportation Commissioner Polly Trottenberg and Hudson Companies President David Kramer for their support of Brooklyn Greenway Initiative. Started in 2004, Brooklyn Greenway Initiative is the nonprofit organization committed to the establishment, development and long term stewardship of the Brooklyn Waterfront Greenway. Broken into 23 distinct segments, the Greenway will be completed as funds are raised, the NYC DOT announced in 2012. There will be a champagne reception, awards program, dinner and live music by Michael Arenella and His Dreamland Orchestra at Wednesday’s gala. It will take place at The William Vale in Williamsburg from 6:30 to 10:30 p.m. Sponsored By 51 Jay St.
A collection of condominiums set in a thoughtfully converted DUMBO warehouse. Designed by acclaimed architecture firm ODA and now over 80% sold! Cobblestone streets. Nineteenth-century brick warehouses. Striking views of the sky and water. Sponsored By Pierhouse at Brooklyn Bridge Park. 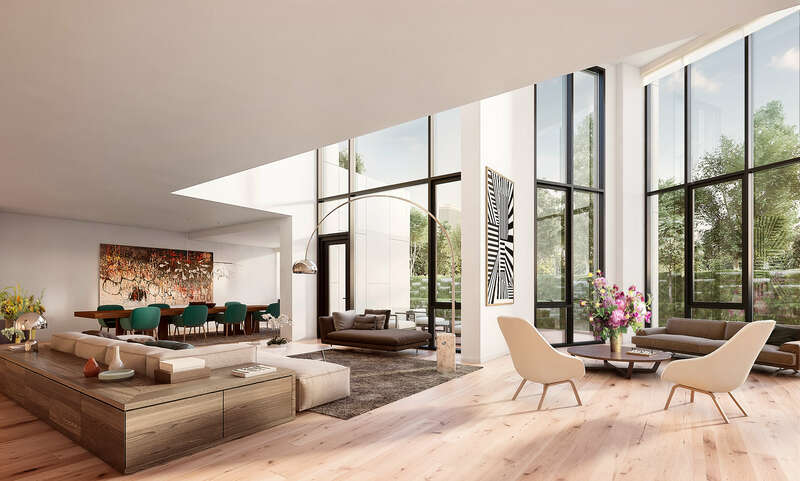 Pierhouse offers expansive one- to five-bedroom, townhome-style condominiums in world-class Brooklyn Bridge Park. Sure, you’ve visited Brooklyn Bridge Park. What if you lived there? Pierhouse, developed by Toll Brothers City Living, provides that opportunity.